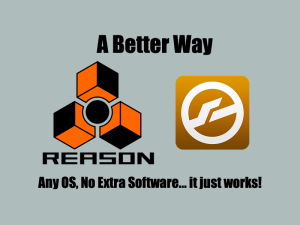 Everyone loves Reason, Kontakt and Native Instruments so why shouldn’t it be real easy to use them together? I figured out a way to bypass all the Cabling Software that can be hard to set up and problematic at times that uses two Audio Devices connected digitally instead. It’s easy to set up, it works in Win and OSX and sounds great. Even more I show you how to Automate Kontakt from Reason. I find using this method to be a very easy way, fast to set up, sounds great, feels great, good clear monitoring in Reason. What do you think? You need to have a audio device hooked up to the stand alone Kontakt as I show in the tutorial. Did you watch the tutorial? In the video you selected “kontakt 5 virtual input” on the external midi device in Reason and in Kontakt – will this show up automatically if you have the two audio devices connected up via digital I/O or is there something else you need to do as well? Thanks Matt. I use a Korg Sv1 as a midi controller for Reason – it’s just a USB connection straight from the keyboard into my laptop – works fine in Reason. What do I need to select as Midi Input/output in Kontakt if I use the two audio devices solution? Sorry to appear dumb but I’m a novice with all the tech stuff!!!! I show all this stuff in the tutorial and if you are a novice the tutorial will be great help to you, did you watch it? Kontakt’s stand alone player has virtual midi ports, do you have the Kontakt standalone player? Also what OS are you using? I have the Standalone 5 player. The OS for my laptop is Windows 7. At the moment when I go into midi setup in Kontakt the choices are either my Korg SV1 or my Focusrite audio device. This is the same when I open up the external midi device in Reason. If I have two audio devices connected as you show in the tutorial will I then see Kontakt virtual input as a selection option in both Kontakt and Reason or is some additional software required? Have you checked to see if it has the virtual midi ports? Also what OS are you using? As mentioned above at the moment Kontakt just shows Korg SV1 (midi controller) and Focusrite (Audio device) when I select Midi Inputs on the set up menu (also only lists these for Midi Outputs). Same when I select Midi Inputs in the External Midi Device in Reason. My operating system is Windows 7. Do I need to install something like LoopBE1 or LoopMidi ( found on Google) in order to create Virtual Midi Ports? Or is there another application that you would recommend for Windows? LoopBE1 is described as being able to connect two programmes. So if I install this, select it in Reason’s Midi External Device and select is as Kontakt’s Midi Input will this work do you think? Do I leave Kontakt’s midi outputs as “nothing selected”. Hope you can help on all this!!! At the moment no virtual midi ports show in Kontakt or Reason – hope you can let me know if LoopBe or an equivalent is the answer….